Sports, arts and entertainment management students worked behind the scenes at some of the biggest concerts and music festivals this summer including Bruno Mars, Shawn Mendes, Chance the Rapper, Farm Aid, The Chainsmokers, James Taylor, The Total Package Tour with NKOTB, Boys II Men and Paula Abdul and more. 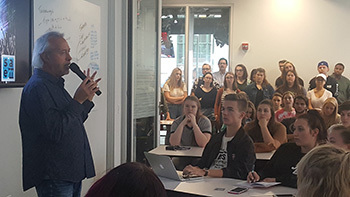 SAEM Associate Professor Ed Traversari, M.B.A., connected the students to many of these summer shows based on his connections with concert promoters AEG at PPG Paints Arena, Live Nation, Drusky Entertainment, Opus One, Grey Area Productions and Stage AE. "It's great to see so many of our students taking advantage of these unique opportunities. There is no better experience than being there and doing it," Traversari said. SAEM majors discuss below their experiences working in the live entertainment management field this past summer as production runners and VIP assistants. "My job for the day was actually to be Shawn's personal driver! It gave me great experience being a runner for a large show as well as working in a high-pressure situation." "Having these experiences on my resume is going to help me stand out from other applicants. We're lucky to have Professor Ed Traversari at our school to help connect us with people at AEG and Live Nation. He always helps us get amazing opportunities!" "Both of these experiences taught me so much about the detail that goes into working in the industry. It was great to be able to work with music industry professionals and hear stories on how they achieved their goals." "These events taught me a lot about the music festival business and helped me expand my professional network. I learned that there are major differences between running a single day show compared to a four-day festival." Pioneer Records student apprentices Ericka Thomas, Kylie Koch, Amber Montz and Mariah Gigler hosted a workshop at Point Park's Center for Media Innovation Sept. 13 focused on production running in the live entertainment business. At the workshop, Traversari gave an overview to more than 80 students on what to expect if they become concert runners. "Production running is something that almost everyone has done at one time or another if they've worked in the entertainment business. It's a great opportunity for students to not only make some money, but also gain valuable hands-on experience working in live entertainment," Traversari explained. Also at the workshop, SAEM senior Baylee Zimmerman discussed with students the networking and other career building opportunities available within the SAEM Club. Point Park University SAEM students and alumni have worked as production runners and VIP assistants at many concerts and other events in Pittsburgh within the past couple of years, including those listed below.